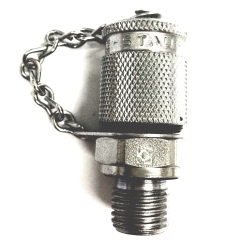 Having difficulties looking for Stauff test fittings? We can help you because we have all sizes. Test Fittings are ports that measuring equipment can be plugged in to monitor and ensure the smooth functioning and operating safety of systems. They are also used for monitoring and control of pressure, venting and sampling in high and low pressure systems. Applicable Medium: General Hydraulic Oil and other mineral oil based fluids.